The department offers a Master’s degree in Chemical Engineering with either a Plan I (thesis) or Plan II (non-thesis) option, or Plan III (coursework only) option as well as a PhD in Engineering with a concentration in Chemical Engineering. General requirements for the degrees offered follow. Information presented here provides a quick overview of the degree programs; consult the UNM Catalog for complete details. Students in the chemical engineering MS program are required to take the core courses listed below. 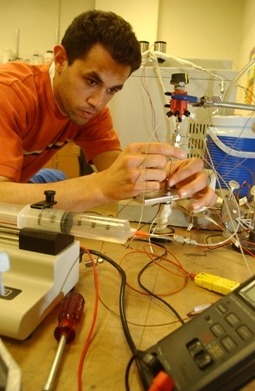 Students admitted to the chemical engineering doctoral program and not already possessing an MS in Chemical Engineering are generally required to complete the chemical engineering core courses. Qualifying Exam: The qualifying exam in chemical engineering consists of an oral exam and is required for all students to proceed in the doctoral program. The Qualifying Exam is mandatory after successful completion of the core classes, which should be completed within the first two semesters of the program. The Qualifying Examination must be passed before applying for Candidacy or proceeding to the Comprehensive Exam.